MUMBAI: Music genre has grown 3.93 per cent with the highest opportunity to see (OTS) in week 11 of Chrome Data Analytics and Media. In the Music genre, B4U Music gained the highest OTS with 84.7 per cent in in HSM excluding the less than 1L-market. Kids category garnered the second position in the gainers list with a growth of 3.69 per cent in all India 1L+ market. Nickelodeon Junior gained the highest OTS with 68.3 per cent. 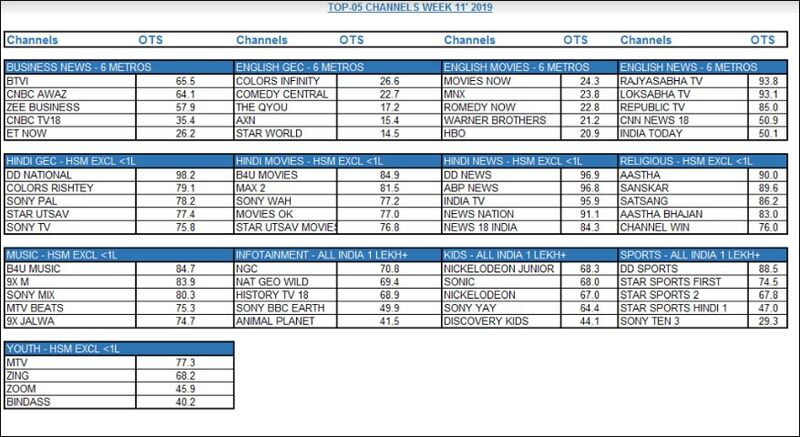 On the third position, Hindi movies genre gained 2.55 per cent growth in HSM excluding the less than 1L-market, with B4U Movies observing the highest OTS of 84.9 per cent. Hindi news genre marked 1.61 per cent growth in HSM excluding the less than 1L-market, with DD News witnessing the highest OTS of 96.9 per cent, followed by religious category securing fifth position in HSM excluding the less than 1L-market by seeing a growth of 1.40 per cent. Aastha gained the highest OTS with 90 per cent.